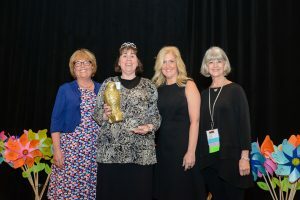 Boston, MA (May 28, 2018) – Synova Associates, LLC, announced this year’s winner of the SPIRIT award at the annual NICU Leadership Forum, held in Ponte Vedra, Florida at the TPC Sawgrass Marriott. This year’s winner was Stephanie Abbu from Monroe Carell Jr. Children’s Hospital at Vanderbilt, in Nashville, Tennessee. The SPIRIT Award is presented to a NICU leader who contributes most passionately to the Synova Experience through networking, professional insight and a spirited presence. In addition to this special award, Stephanie also receives a complimentary tuition to the 2019 NICU Leadership Forum. The selection criteria requires leaders to attend all education and networking sessions as well as all social activities during the conference. The Spirit Award winner always shows an unyielding commitment to getting to know other attendees – particularly making the new leaders feel welcomed. Past winners have and continue to lead, present, and demonstrate leadership throughout the conference. A defining factor for those who stand out is their ability to show energized spirit and joy towards their fellow nurse leaders and their profession. “Stephanie was a natural when it came to selecting this year’s SPIRIT Award winner,” said Chrissy Burke, Partner, Synova Associates. “The committee of past winners unanimously agreed that she has a high level of energy, has contributed to the overall experience, has tremendous leadership strength, and an innate ability to connect with others that permeates the room when she enters. She is truly an outstanding asset to the nurse leadership community,” said Burke. Past SPIRIT Award winners included David Haggard, Children’s Medical Center, Dallas, TX (2017); Pam Middleton, Kaiser Permanente, Oakland, CA (2016), Cathy Allen, Rapid City Regional Health, Sioux Falls, SD (2015), Janet Wirt, Rady Children’s, San Diego, CA (2014), Sarah Currie, Children’s Hospital of Wisconsin, WI (2011) and Kathy Gray, Kaiser Permanente, Oakland, CA (2006) – who won in the Spirit Award’s inaugural year. Synova Associates NICU leadership forum draws nurse leaders from all over the country to meet, address vital NICU challenges together, share best practices and effective solutions. It’s the only nurse leadership conference of its kind and has been catering to the nurse leader community for over 22 years.